I had used the service that Oxford City offer - travel on their team coach to any game for £10 before, when I went to Halifax in September. It had been a generally excellent service, the only drawback being that I had to hang around a bit at the end of the game, but for that bargain price, you couldn't complain. It made the difference between being able to go and not being able to go. I had enjoyed it and so started looking at other games I could do. But the opportunities were limited, the fixtures didn't fall right - every game I wanted to go to I had plans elsewhere. But one of the few benefits of the totally disgusting weather we had got during our 6 month long winter, was that a lot of games had to be crammed in a short space of time, meaning Thursday night games. With me starting at 5am (getting up at 4) my sleep pattern would be severely disrupted, but balancing everything up, I decided it was a good choice. Mainly because Colwyn Bay is quite a way from anywhere, so it would be expensive to do, and also there was a decent pub near the ground. Looking at the league table Oxford City were well clear of relegation. 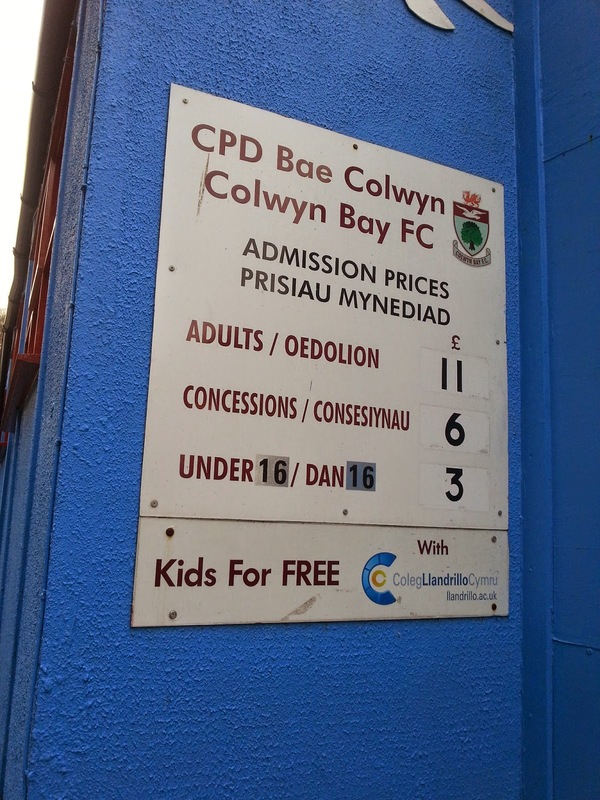 Colwyn Bay were battling to save their lives - a win would lift them out of the relegation zone on goal difference. Completing the Conference North had been a possible target for me next season, so I was a bit disappointed to see that one of the teams I had done - Hinckley - were already down, and out of the teams below tonight's visitors, I had also been to Boston, Bishops Stortford, Histon and Corby, so I would almost certainly be losing a couple off of my list. In terms of ex Wycombe players Colwyn Bay had Frank Sinclair as player manager - Sinclair having looked solid in the handful of games he had played under Peter Taylor in the 2008/09 season. For Oxford City there was youngster Josh Mulvany, picked up from Southampton as a youngster, but never got beyond the reserve team, despite showing great promise. On the day I was working, officially till 1, but I knew that I could get off early if I got my work done. In the end I got away at 12 and after getting changed I drove to Oxford City, arriving at 12.40. The coach left pretty soon after the scheduled 1pm departure, stopping to change drivers and pick up some players at Banbury. The team were down to their bare bones, having to call up players from their Oxford City Nomads reserves side that play in the Hellenic League. They even had to phone up to check that the players were registered, given the financial and points deduction penalties that get placed upon teams if mistakes are made. After a stop at some random Little Chef, we were at the ground just after 6. I had already done my research and found a pub, the Red Lion, that did real cider. I had a bargain couple of pints of various Gwynt-Y-Ddraig cider.as ever it was delicious, and cheaper than I had ever had it at 2.40 a pint. It's from my favourite brewery and normally costs at least a quid more a pint. 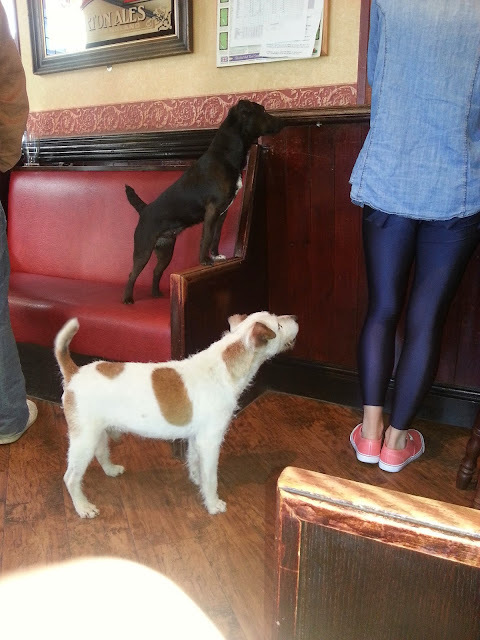 There were also a couple of friendly dogs at the pub too. After that I made my way up to the ground, stopping at a chip shop for my dinner. After paying to get in and getting a programme, I went and had a look in the club shop and took some pictures of the ground. With Colwyn Bay desperate for a win and Oxford City decimated my injuries, everything pointed to the home win, which turned out to be the case as the report on the Oxford City site indicates. 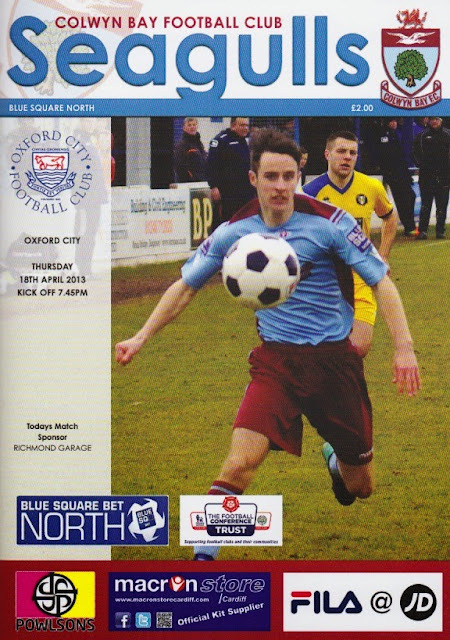 An understrength Oxford City slipped to a 3-1 defeat at relegation-threatened Colwyn Bay in Blue Square Bet North last night. City, who gave a debut to keeper Juan Martin in place of the injured Nick Townsend, could manage only a consolation effort from substitute Mark Bell on 76 minutes. Colwyn took the lead through Shelton Payne on five minutes and the same player made it 2-0 after a 53rd-minute breakaway. The hosts wrapped up the points with a goal from Rob Hopley five minutes later. Zac McEachran headed over for the visitors from fellow substitute Jamie Cook’s cross before Bell pulled one back. City will be without Andy Ballard for tomorrow’s trip to Droylsden as he starts the first of a three-match ban. After the game I had to wait around for the team to get changed and get back on the coach. In the end it was around 10.40 before we got going. I think we made pretty good time overall. I have no idea whether we stopped or not, because I had a good sleep. I must have got about 3 hours I guess, which was good as I can never normally sleep on coaches. We got back to Oxford at 2.30am, only 90 minutes before I was due to get up for work. However, a quick drive home had me in just after 3am and I had a lie down for an hour, even if I didn't get any further sleep. LLANELIAN ROAD is one of the smaller grounds in the Conference North, having a capacity of 2500. This includes 500 seats, which are along the side and covered. The other side is fully covered too, along with behind the goal, which means around 1200 supporters can be protected from the weather and stand on reasonable quality terracing. The other end, where the clubhouse and lots of other facilities are located, has a capacity of around 300 on flat standing. The clubhouse is pretty big, and although nothing special cider wise, it does offer quite a few beers, including a club one. The tea bar does a good range at reasonable prices, while the club shop has a selection of old books and programmes, as well as the usual stuff. It was another enjoyable visit, and one that I would have been hard pushed to do without the coach from Oxford.